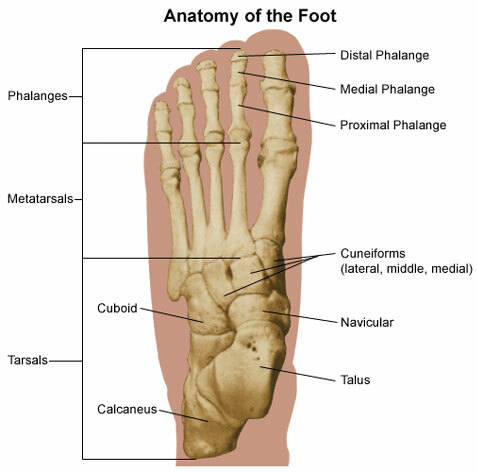 The foot is one of the most complex parts of the body, consisting of 38 bones connected by numerous joints, muscles, tendons, and ligaments. The foot is susceptible to many stresses causing foot pain, inflammation, or injury, resulting in limited movement and mobility. Foot pain is often caused by improper foot function. Improperly fitted shoes can worsen and, in some cases, cause foot deformation. There are many types of foot problems that affect the heels, toes, nerves, tendons, ligaments, and joints of the foot. •	What is an ankle sprain? • What is a foot fracture? • What is foot pain? Pain in the ball of the foot, located on the bottom of the foot behind the toes, may be caused by nerve or joint damage in that area. In addition, a benign (non-cancerous) growth, such as Morton's neuroma, may cause the pain. Corticosteroid injections and wearing supportive shoe inserts may help relieve the pain. Sometimes, surgery is necessary. The Achilles tendon is the largest tendon in the human body. However, this tendon is also the most common site of rupture or tendonitis, an inflammation of the tendon due to overuse. Sprains and strains - muscles and ligaments can be overstretched or twisted. The knee and ankle are especially vulnerable. Stress fractures - exercise moves that require force and repetition, such as jogging or even dancing on concrete or any very hard surface, may cause small breaks in the bones of the foot and ankle. Tendonitis - painful inflammation of a tendon (connective tissue that anchors muscle to bone). Blisters – poorly fitting shoes that rub can cause blisters on the feet and toes. Toenail injuries – poorly fitting shoes that crowd the toes may lead to bruising of the toenails or ingrown toenails. Impact injuries - such as bruises, caused by falling over, bumping into another person or tripping over objects or props nearby. Reflexology is the physical act of systematic manual stimulation through variable pressure of the reflexes located in the hands and feet. Before this discovery, it was thought that reflexology had ancient origins and might have developed alongside the ancient Chinese practices of acupuncture. Likewise, North American Indian medicine men are believed to manipulate and stimulate the feet as a part of their healing practice. Modern Reflexology was popularized by Eunice Ingham, a physical therapist, who brought Reflexology to the American public through classes, workshops and publications until her death in 1974. What can you expect from a Reflexology treatment? Reflexology is a non-invasive, drug-free therapy. Your practitioner will take a medical history before he/she will send you to a physical therapist for treatment. You will never be asked to disrobe but will be asked to remove your shoes and socks. While seated in a comfortable chair you will receive a therapeutic foot soak with an aromatherapy component if you like. The therapist will begin with relaxation techniques followed by applying firm but gentle pressure to each of the reflex points in the hands and feet with the option of Hot Stone Reflexology or other treatment that will aid your recovery. Many clients find this to be deeply relaxing and take a short nap during treatment which will last between 20-45 minutes. After treatment it is advised that you drink plenty of fresh water to help flush toxins from your body and that you eat lightly for the rest of the day. Also, pay close attention to the instruction of your therapist. Through our therapist’s treatment and instruction we can care for our feet and entire body, bringing it into balance and promoting good health. Providing more than pain relief, treatment has been shown to enhance your body's ability to heal more quickly, and help increase stamina, providing more energy and less injury.